2015 is almost over. Like most, the holiday season was filled with tasty items such as, alcohol, desserts, fried foods and all around delicious foods. The holiday delights taste great, but will cause crazy inflammation and weight gain, making you feel terrible! This guide isn’t to quench your appetite in finding some type of fad or shortcut, but to give you tangible information to jumpstart 2016, the healthiest year of your life. You are a walking car battery- When you eat fatty foods, junk food, basically the cramp you may know you shouldn’t eat. Your body becomes very acidic and as a result your body becomes inflamed and produces mucus. This inflammation and mucus is a big contributor to unwanted weigh gain and many illnesses that people feel this time of year. Detoxing periodically or during the last week of the year is an effective way to allow your body to repair itself. At SWXLLER, we preach that food is fuel, so think of a detox as a fuel system cleansing your body. Strive to be ALKALINE! To be alkaline, simply means bringing your body’s PH levels down to a lower level. The foods that help you become alkaline not only help heal your body, but help to reverse the effects of the damage that acidic foods do to your body. Forget all the “lose 10 pounds in 10 minutes” detoxes that you see all over the internet. True, these detoxes will help you lose weight, but they will also leave you extremely dehydrated and malnourished. The goal of any detox should be to bring your body to an ALKALINE state. Detoxing is only a jumpstart, not a fix. Whether you are seeking a desired body type, improvement as an athlete, or become healthier, you will have to make a lifestyle change. A detox is pointless, if you plan or unexpectedly consume a supersized #3 from your local fast-food restaurant days later. Sound nutrition principles followed for an extended period of time is the true key to dropping body fat. This particular detox recipe has been effective at decreasing inflammation, excrete unwanted water, and helping you feel fantastic overall. For 48-72 hours depending on the severity of your circumstances, you will have 3 of these alkaline filled shakes, followed by 1 meal at the end of the day. The “end of the day” meal will include either salmon or chicken, celery or spinach, and wild rice or sweet potato. • Lastly, you will drink 1oz of water per pound of body weight each day of the detox. 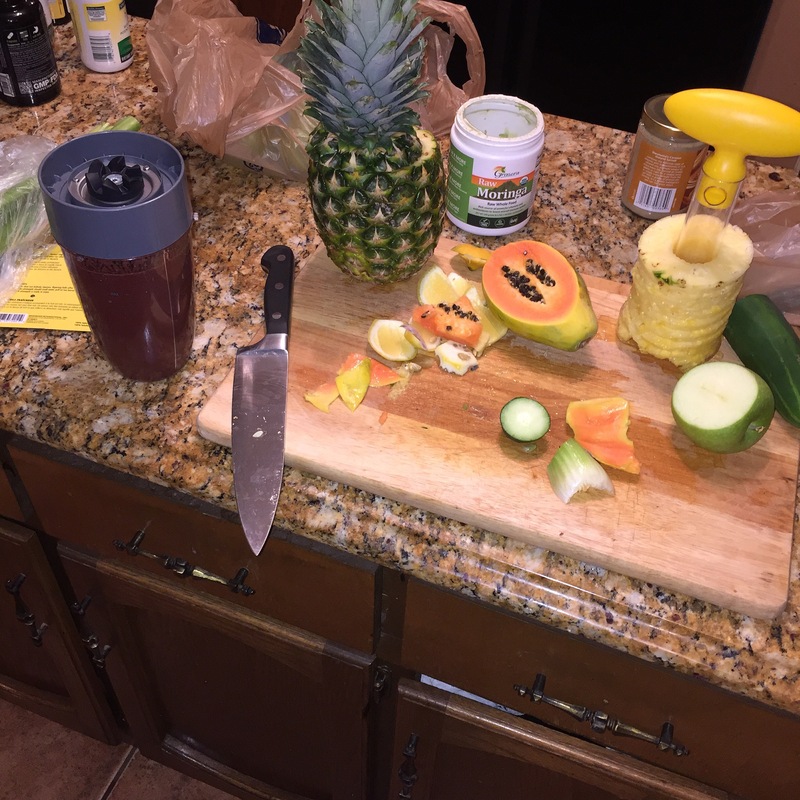 Posted in Blog, FitnessTagged detox nutrition new year. Next How not to be a NARP (Non-Athlete Regular Person) in the Gym?